Muammar Qaddafi continued to be little more on Thursday than the mayor of Tripoli, but he bared his fangs with murderous attacks on protesters in the vicinity of the capital..
And, note to Col. Qaddafi: Al-Qaeda is not a mass movement and cannot put people in the streets. Think about it. Al-Qaeda has a handful of mad bombers, who try to blow things up. Big crowds in the streets– not an al-Qaeda M.O. Qaddafi tried to blame al-Qaeda for the unrest on Wednesday and Thursday. It is such a blast from the past. The Bush administration also tried to manipulate the public with constant fearmongering about al-Qaeda taking over the world, and fraudulently used the fringe group to justify its Iraq War. Attempts by Qaddafi’s military and paramilitary forces to retake the major city of Misurata (or Misrata) about 100 km east of Tripoli failed miserably. Oppositionists defeated Qaddafi loyalists at the city’s airport and in its outskirts, and by late Thursday had declared the country’s third-largest city firmly in the hands of the rebels. The latter set up citizens councils. On the other hand, Qaddafi security forces viciously repressed dissidents in the city of Zawiya (pop. 150,000) , 40 km southwest of Tripoli. It is Libya’s fourth-largest city. There are reports of an army attack on protesters who had taken refuge in a mosque, in which machine guns and rocket-propelled grenades were deployed. Some said 20 persons were shot down, and hundreds wounded. Eyewitnesses spoke of it as a ghost town. Qaddafi added insult to injury by broadcasting a bizarre message to the people of Zawiya insisting that young people there were only in rebellion because they had been given “hallucination pills,” and that al-Qaeda was behind the disturbances. There is no sign that Muslim extremism is playing any role at all in Libya’s liberation movement, though some cities, such as Dirne in the West, are known for the piety of their residents. Qaddafi loyalists also still control Surt (Sirte) to the east of Misurata, a city of 128,000 or so, near which Qaddafi was born. Residents of liberated Misurata worry about being the object of a pincer movement by Qaddafi forces in Tripoli and Surt. Qaddafi’s police and army still seem mostly in control of the capital, Tripoli, itself. Nevertheless, there were calls for masses to come out into the streets after Friday prayers in an attempt to shake the regime. 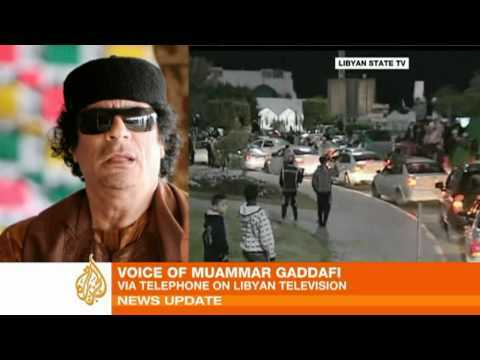 Aljazeera English has a translation of some of Qaddafi’s bizarre and rambling speech on Thursday.